UPDATE 10/1/12: Cafe Press is stocking business cards again, so you can now purchase mini-handouts (if the whole DIY Flickr option isn’t your jammy jam). Find the cards here. Remember that time when you were walking your DINOS and you noticed a woman and her dog walking straight at you? Remember how you looked around, wondering if there was someone behind you, but there wasn’t, so you realized she was coming for YOU? Remember how she had a big smile on her face as her goofy dog dragged her towards you at an alarmingly fast pace? And how you had to scramble to get out of the way, but she kept calling “Wait, my dog is friendly!” and “My dog just wants to say hi!” as she chased you across the park? 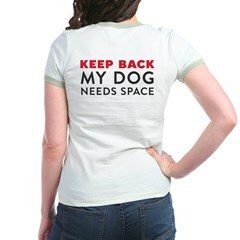 And then, sick of hiding behind trees, you turned around and said, “My dog needs space. Here’s a card that explains everything. See ya!” and then you skipped home smiling because, for once, you didn’t waste any time trying to explain your DINOS to a stranger? Remember that time? I whipped up a teeny tiny, business card size version of the DINOS Manifesto. It’s available to all of you to download for free and print at home. Yippee! 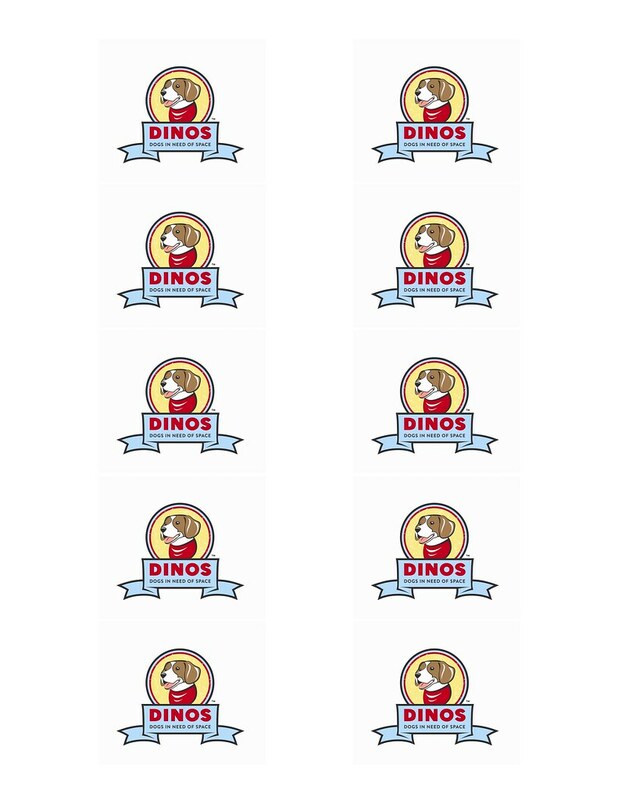 All you have to do is go to the new Team DINOS Flickr page and you’ll see two images: DINOS Cards Front and DINOS Cards Back. Download both images (choose “original” size), then print them out (double-sided style) on a regular sheet of paper or, better yet, business card paper. Viola! You have a pocket-size handout to give out to MDIFs you meet on your walks. 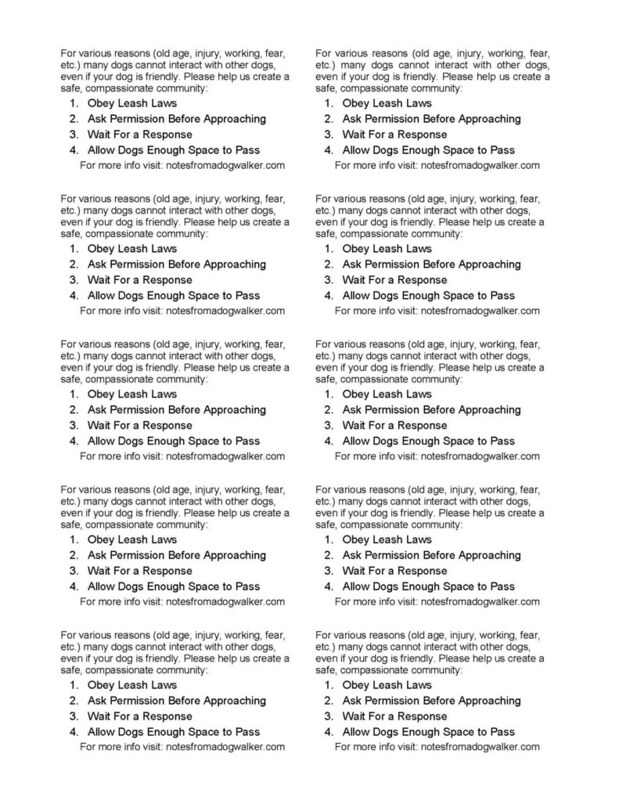 If you live in an area without leash laws or if you use the term “lead” instead of “leash”, here’s a version for you. I know there’s much more we’d all like to say, but that’s all I could cram onto a business card in a regular size font! If you’d like to share the full length version, check out the DINOS handouts. 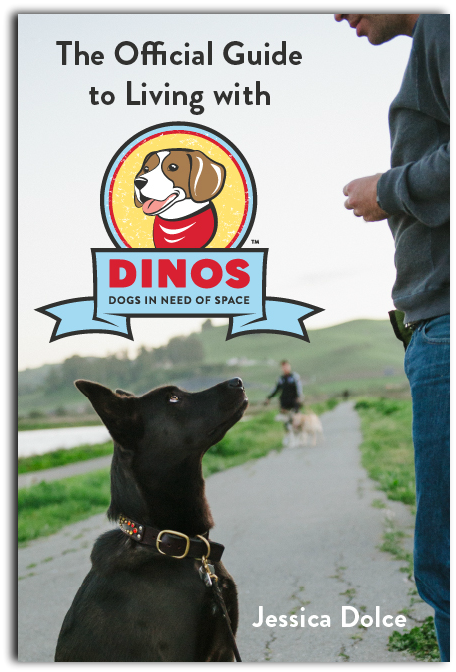 I hope you find these helpful as you spread the word that DINOS are GOOD dogs, they just need space! This is fantastic! I’ve never lived with a DINOS dog but I know people who have or who do, and these would come in very handy for them. Thank you, thank you, thank you! Could have used one today. Can anyone tell me if the t-shirts are available yet? Lovely. 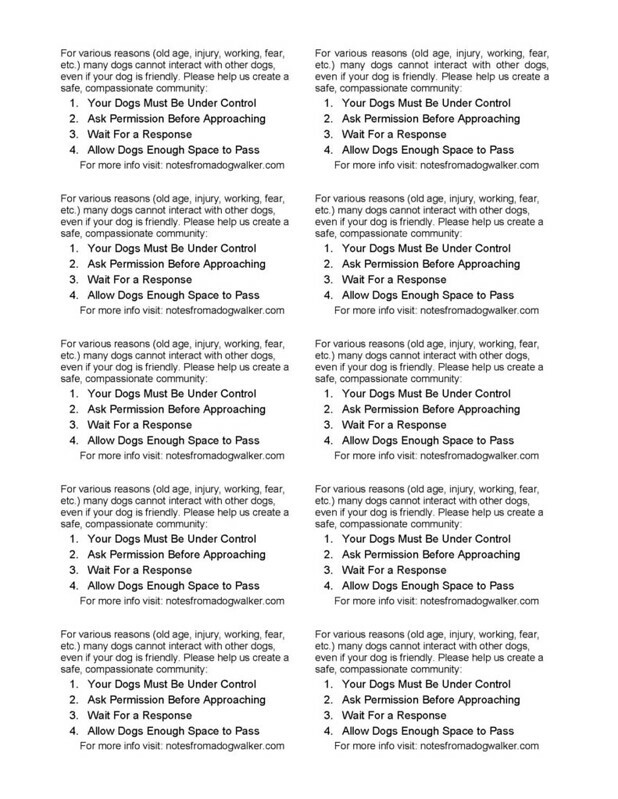 Wish I had the money to mail these to every dog owner in my community. These are so great! I feel empowered! LOVE IT!!! Printing them up right now!!! We have leads, not leashes, and I don’t think there’s any such things as leash laws – just rules about their use in certain places. I’m not sure whether they’re legally enforceable, and if so, by whom. I wouldn’t want to remove #1 altogether – it really should say something about sensible use of the lead (e.g. 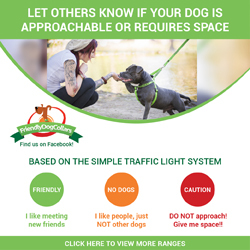 if you can’t control your own “friendly” dog without one, or just if you see somebody else with *their* dog on a lead), but obviously that’s way too wordy. I wish I could think of something more succinct. Does anybody else have any ideas? The thinking behind that option is that if a dog is on a lead in a place where most other dogs aren’t, there’s probably a good reason for it, and you don’t want to find out the hard way. P.S. The typeface is rather fuzzy in the JPEG. Might a PDF be crisper? Thanks – I’ll think about a short version of that idea. It may just have to be – have your dog under control (it’s pretty tough to address off leash dog etiquette in one sentence!). The text prints out clearly (and needs to be a JPEG for Flickr), but thanks for the suggestion. Here’s the new version Julie. Sorry it took so long and I hope it works better for you! These are wonderful and I am going to give them to clients! Thanks Karen! I hope they’re helpful to your clients. Let me know how it goes! I was just talking to my husband the other day about finding handouts for this reason (I had a guy with a golden come chasing after us with the MDIF, after I had asked him to call his dog back to him)! Thank you for doing such a nice job. I can’t wait to print them out. They’ll be great to hand out on the trail. Let me know how it goes! Safe walking!